For other uses, see Zinnia (disambiguation). Sanvitaliopsis Sch.Bip. ex Benth. & Hook.f. Zinnia is a genus of plants of the sunflower tribe within the daisy family. They are native to scrub and dry grassland in an area stretching from the Southwestern United States to South America, with a centre of diversity in Mexico. Members of the genus are notable for their solitary long-stemmed flowers that come in a variety of bright colors. The genus name honors German master botanist Johann Gottfried Zinn (1727–59). Zinnias are annuals, shrubs, and sub-shrubs native primarily to North America, with a few species in South America. :338- Most species have upright stems but some have a lax habit with spreading stems that mound over the surface of the ground. They typically range in height from 10 to 100 cm tall (4" to 40"). The leaves are opposite and usually stalkless (sessile), with a shape ranging from linear to ovate, and a color ranging from pale to medium green. The flowers have a range of appearances, from a single row of petals to a dome shape. Zinnias may be white, chartreuse, yellow, orange, red, purple, or lilac. Zinnia acerosa – Arizona, New Mexico, Texas, and Utah in the United States; Coahuila, Durango, Michoacán, Nuevo León, San Luis Potosí, Sonora, and Zacatecas in Mexico. Zinnia americana – Chiapas, Guerrero, Honduras, Jalisco, Michoacán, México State, Nayarit, Nicaragua, Oaxaca, and Veracruz. Zinnia angustifolia – Chihuahua, Durango, Jalisco, San Luis Potosí, and Sinaloa. Zinnia anomala – Texas; Coahuila, and Nuevo León. Zinnia bicolor – Chihuahua, Durango, Guanajuato, Jalisco, Nayarit, and Sinaloa. Zinnia citrea – Chihuahua, Coahuila, and San Luis Potosí. Zinnia elegans from Jalisco to Paraguay; naturalized in parts of United States. Zinnia flavicoma – Guerrero, Jalisco, Michoacán, and Oaxaca. Zinnia grandiflora – Arizona, Colorado, Kansas, New Mexico, Oklahoma, and Texas; Chihuahua, Coahuila, Nuevo León, Sonora, and Tamaulipas. Zinnia haageana – Guanajuato, Jalisco, México State, Michoacán, and Oaxaca. Zinnia juniperifolia – Coahuila, Nuevo León, and Tamaulipas. Zinnia maritima – Colima, Guerrero, Jalisco, Nayarit, and Sinaloa. Zinnia microglossa – Guanajuato and Jalisco. Zinnia peruviana – widespread from Chihuahua to Paraguay including Galápagos and West Indies; naturalized in parts of China, South Africa, and the United States. Zinnia purpusii – Chiapas, Colima, Guerrero, Jalisco, and Puebla. Zinnia elegans, also known as Zinnia violacea, is the most familiar species, originally from the warm regions of Mexico being a warm–hot climate plant. Its leaves are lance-shaped and sandpapery in texture, and height ranges from 15 cm to 1 meter. Zinnia angustifolia is another Mexican species. It has a low bushy plant habit, linear foliage, and more delicate flowers than Z. elegans – usually single, and in shades of yellow, orange or white. It is also more resistant to powdery mildew than Z. elegans, and hybrids between the two species have been raised which impart this resistance on plants intermediate in appearance between the two. The Profusion series, with both single and double-flowered components, is bred by Sakata of Japan, and is among the most well-known of this hybrid group. Zinnias seem to be a favorite of butterflies as well as hummingbirds, and many gardeners add zinnias specifically to attract them. Zinnias are popular garden flowers because they come in a wide range of flower colors and shapes, and they can withstand hot summer temperatures, and are easy to grow from seeds. They are grown in fertile, humus-rich, and well-drained soil, in an area with full sun. They will reseed themselves each year. Over 100 cultivars have been produced since selective breeding started in the 19th century. Zinnia peruviana was introduced to Europe in the early 1700s. Around 1790 Z. elegans (Zinnia violacea) was introduced and those plants had a single row of ray florets which were violet. In 1829, scarlet flowering plants were available under the name 'Coccinea'. Double flowering types were available in 1858, coming from India, and they were in a range of colors including shades of reds, rose, purple, orange, buff, and rose stripped. :338- In time, they came to represent thinking of absent friends in the language of flowers. Experimentation aboard the International Space Station has demonstrated the capability of zinnias to grow and blossom in a weightless environment. In the Americas their ability to attract hummingbirds is also seen as useful as a defense against whiteflies, and therefore zinnias are a desirable companion plant, benefiting plants that are inter-cropped with it. Zinnias are grown in the summertime. ^ "Genus: Zinnia L." Germplasm Resources Information Network. United States Department of Agriculture. October 5, 2007. Retrieved October 14, 2010. ^ a b c d Neil Owen Anderson (October 2007). Flower Breeding and Genetics: Issues, Challenges and Opportunities for the 21st Century. Springer. ISBN 978-1-4020-6569-9. 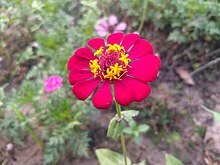 ^ "Zinnia in Flora of North America @ efloras.org". efloras.org. ^ "2013 BONAP North American Plant Atlas. TaxonMaps". bonap.net. ^ Bees pollinate the florets of Zinnias. The rarest of zinnias are white. Zinnias can be dwarf with more flowers than tall zinnias. Zinnias can only be grown in the seeds. Once dried the seeds are useful for making teas. Dried florets have been good for reproducing the next generation. It won't produce the same color. The parent will die and the offspring will produce mixed of colors. "Monarch Watch". The Kansas Biological Survey, Univ of Kansas. May 27, 2008. Retrieved May 27, 2008. ^ "Saving Butterflies Insect Ecologist Spearheads Creation of Oases for Endangered Butterflies". ScienceDaily. January 1, 2005. Archived from the original on June 4, 2008. Retrieved May 27, 2008. ^ Singh, A.K. (1 January 2006). Flower Crops: Cultivation and Management. New India Publishing. pp. 403–. ISBN 978-81-89422-35-6. ^ "Language of Flowers – Flower Meanings, Flower Sentiments". www.languageofflowers.com. Retrieved 2016-11-26. ^ Johnston, Ian (16 January 2016). "First flower grown in space shows there is 'other life' out there". The Independent newspaper. This page was last edited on 22 October 2018, at 00:45 (UTC).